Creating the Ultimate Win-Win | Community Building | Upcoming Events | Special Offers | and more! * Been Feeling A Little Raw? want to receive notification of new blog posts in your inbox? Spring, I mean Summer, Cleaning! 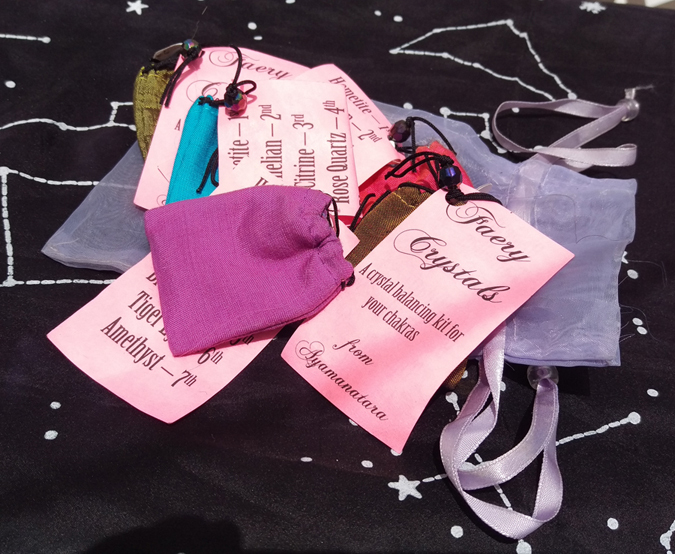 In the old merchandise I no longer have room for are these marvelous bags of Faery Crystals: small chakra stone sets infused with Faery energy. Only $4 each (plus shipping, or arrange to pick them up from me!). Message me to order or for more information. I have 4 small bowls that came back to me from a boutique. Priced at $40, I am willing to let them go for $30 each (plus shipping, unless you're local and can arrange pickup). 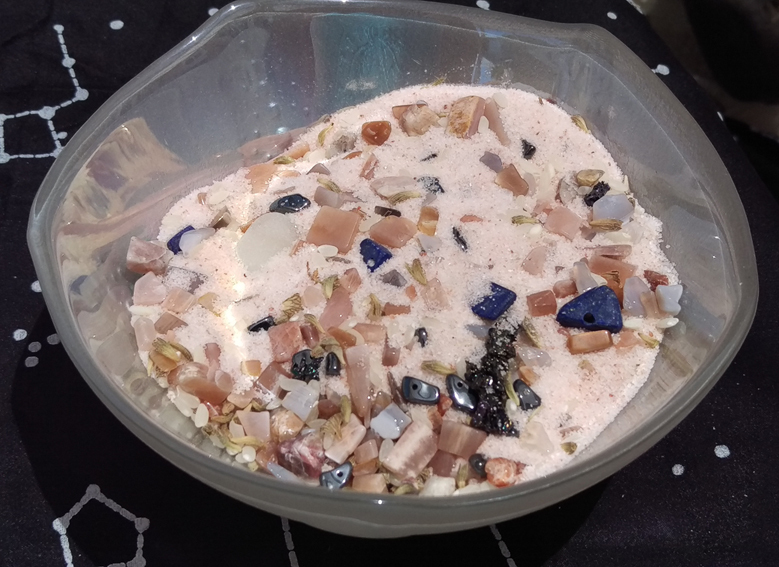 (1) Connect to Your Divine Self; (2) Lift Your Spirits; (3) Relieve Pent-Up Emotions from Monthly Hormonal Shifts; (4) Clear Negativity and Anxiety. Message me to arrange purchase and delivery. 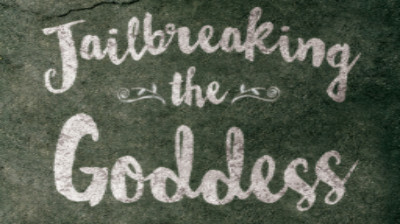 Jailbreaking the Goddess by Lasara Firefox Allen is now out! I cannot recommend this book enough as a more balanced, intersectional model for working with the Feminine Divine and with yourself. With everything that is going on in the world, I've been shewing on a lot of threads. They have all come together in a recipe for creating the Ultimate win-win situation (below). I hpoe you implement it and share with others. I also want to point you to an amazing ritual from Luisah Teish, combining rain and peace, two of the threads I've been chewing on. In the vein of community building and re-strengthening ourselves, I am so very pleased to announce that the (facitiously named) Black Arts Ice Cream Social is finally becoming a reality! 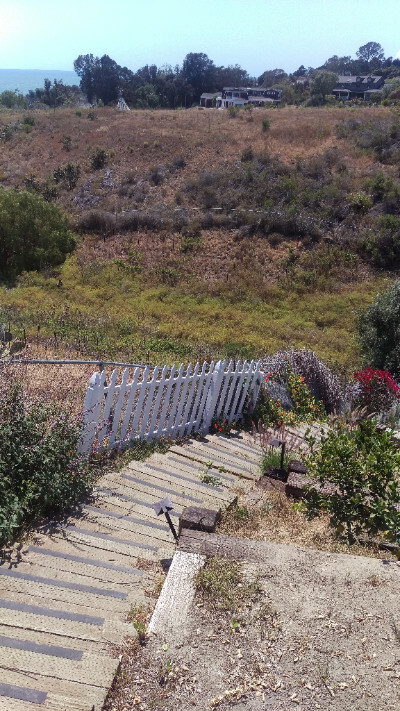 We are a low-key social gathering in the LA area, meeting monthly, of people who fall under the greater alternative spirituality heading, designed to foster a sense of community, without it having to be about how you practice your beliefs. We want to include people who define themselves as: Pagan, Gnostic, OTO, Hermetic, Non-denominational Spiritual, Shaman, Ceremonialist, Metaphysical, Church of the Flying Spaghetti Monster, Church of Starry Wisdom, Chaos Magician, Witches, Wizard, Hoodoo, Sorcerer, Earth Magic, Reiki Practitioner, Wicca, Strega, Feri, Gardnerian, Alchemist, Spiritualists, Toltec, Bon Po, Rosecrucian, Solitary Practitioner, Caanonite, Voudon, Santeria, Magi, Kitchen Witch, Hedge Witch, Kabbalist, Anthrosophist, Reclaiming, Indigo, Discordian, Niburian, and people who identify with the principles of their religion of choice without feeling like they fit into whatever mold that religion has given them. Our inaugural event will be Sunday, August 21st, and every third Sunday of the month thereafter, from 3-5pm in Glendale. December's even will be a Yule celebration. The presentation topic for August will be "Using Spiritual Tools on the Internet to Slay or Avoid (drama) Llamas." We ask for a $10 donation at the door to help cover expenses. Please join us! "Using Spiritual Tools on the Internet to Slay or Avoid (drama) Llamas"
In the past few years, the veil of illusion that separates the majority of the population from the people in power has become more flimsy. People catch glimpses of reality often enough to be aware that the Wizard is not All That and the Emperor is having a wardrobe issue. The thing is, they're just glimpses. It's enough to get folks' hackles up and make us jumpy, but the impressions aren't solid. It makes people have to assume, instead of sort through data, and they don't want to sort through the facts that *are* available. The impulse has become "We got fooled before, it's not going to happen again!" The challenge is that this makes it easier to manipulate people, rather than harder. All anyone has to do is play to the first and second chakras - survival and emotion - and the higher functions don't get a chance to intervene. The way out is not to look for a Savior. The way out is to realize what equality and empowerment really mean, and to create partnerships and alliances. You contain the entire blueprint of the Divine. So does the person to your left and to your right. Each of you may have a slightly different understanding of what that means. Each of you may access your power, the power of the Universe, in a slightly different way. Imagine the strength that can come from joining forces. It's like the idea of running batteries in serial or hyperthreading a processor. The fastest way to do this is to simultaneously own your power while acknowledging and honoring the (equal) power of those around you. We are each a cell in the body Divine. We each have the entire blueprint of Divinity within us. If I stand in my Godself, and I connect to your Godself, each of us becomes a human being in the interaction, and that interaction becomes about the people, not the transaction. Then, and only then, do we create real, tangible, measurable, permanent change in the world. It is the ultimate win-win.